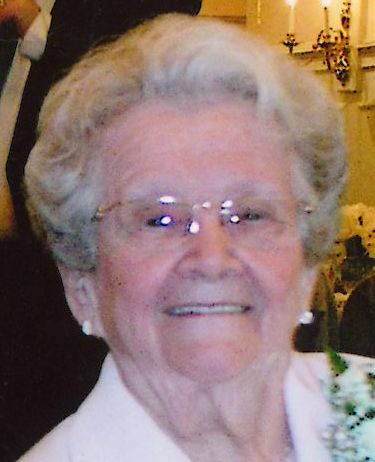 Frances P. (Sullivan) Sheehy, 94, of Lawrence, passed away peacefully on Tuesday, January 15, 2019, at the Prescott House in North Andover. She was a very devoted and caring mother, grandmother, and great grandmother. The daughter of the late David S. and Mary F. (Kelley) Sullivan, Frances was born in Lawrence on October 5, 1924. She was a graduate of St. Laurence O’Toole Grammar School and St. Mary’s High School, Class of 1942. She was employed at the Arlington Mills as a clerk, first in the weave room office and later in the main office until raising her family. She later was employed by the Commonwealth of Massachusetts – Department of Public Welfare and later by the Department of Social Services as a Social Service Technician, retiring in 1987. Frances was a member of the former St. Laurence O’Toole Parish, the former Holy Trinity Parish, and later Corpus Christi Parish. She was a lifelong Lawrence resident and enjoyed doing crafts. She was a very devoted and caring mother and grandmother. Frances was predeceased by her husband, John A. Sheehy, her three sons, John D. Sheehy and his wife Janice A. (Faerber) Sheehy, James F. Sheehy and Thomas W. Sheehy, and two brothers, David J. Sullivan and William J. Sullivan. Frances is survived by her grandchildren; Brian J. Sheehy and his wife Melanie of Methuen, Christopher R. Sheehy of Methuen, Julie A. Traynor and her husband Stephen of Manchester, NH, and Laura L. Paquin and her husband Daniel of Manchester, NH; Her great-grandchildren, Brynn Sheehy, Owen Sheehy, Connor Sheehy, Abigail Traynor and Brielle Traynor; A daughter-in-law, Esther R. (Nutton) Sheehy of Londonderry, NH, and several nieces, nephews, cousins and friends. Frances’ family would like to extend their appreciation and gratitude to all her friends and staff at the Prescott House for their kind and compassionate care.